Featured in magazines, books, newspapers, exhibition catalogs, TV. 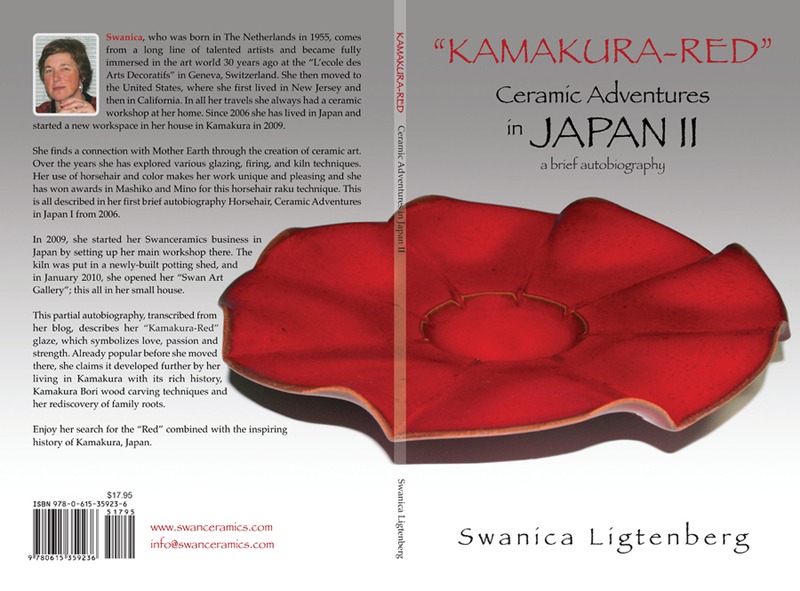 2010 March: My second autobiographic booklet: “Kamakura-Red”, Ceramic Adventures in Japan II. This booklet was updated and reprinted in March 2011. My “Kamakura-Red Ware” is inspired by the texture and red color of the Kamakura Bori Wood Carving Art. 2014 October: Honorable Mention for the "Duo Ferric Horsehair Boxes" in the MINO Ceramics International Competition. 2006 Mashiko Special Judges Award in MASHIKO Ceramics International Competition with my Horsehair Raku "Four Season" Vase. 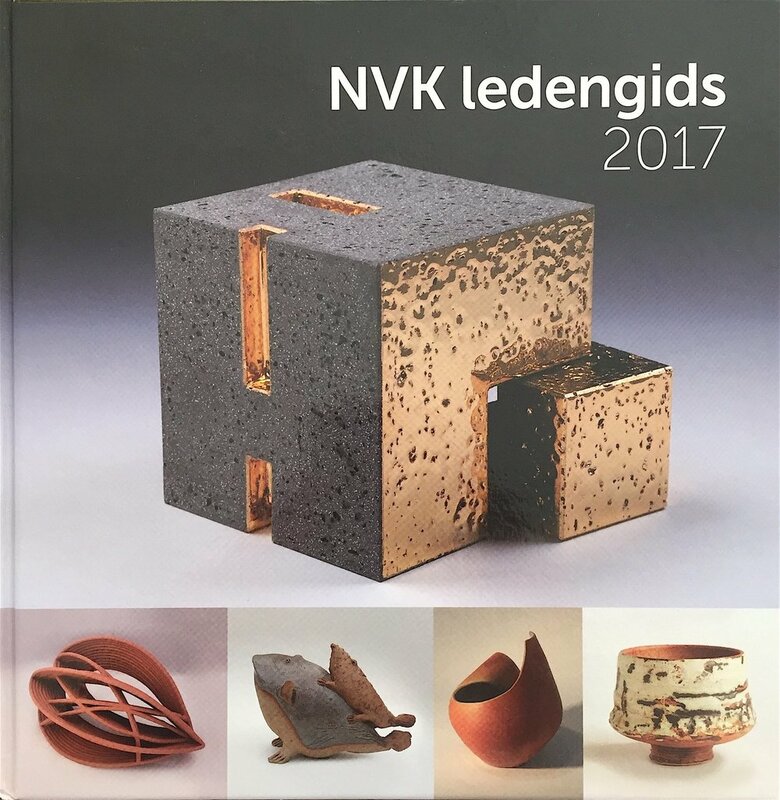 2011: My 2006 Mashiko Special Judges Award Horsehair Raku “Four Seasons” Vase is published in this 500 Raku book by Lark Crafts. 2010 Nov. 27 - Dec. 9:“Wing: Love is a bird, she needs to fly” Exhibition at the Toko Gallery in Mashiko. 2010 September: The Kamakura-Red Japonica Vase in the Alexander Salazar Fine Arts Gallery in San Diego, USA. 2010 May 21: Lecture at Kamakura YMCA. 2010: Catalogue “Modern Pot Art” from The 2010 Second China (Shanghai) International Modern Pot Art Biennial Exhibition. They awarded my “Kamakura Red Bamboo” Teapot. 2010 April: A booklet about the exposition of my uncle goldsmith Rudie Arens jr. and his father, my grandfather goldsmith Rudolph Arens at the “Valkhof” Museum in Nijmegen in the Netherlands. It is also a family exhibition in which my “Angel” Kamakura red teapot and cup, and 2 small plates are shown. 2010 March: A book written by Yuki Shibazaki-san about the influence of the Japanese culture on 43 foreigner living in Japan. I am one of them. 2010 January: Article in The Shonan Post, an English monthly Kamakura newspaper, about the opening of my Swan Art Gallery. 2010 January: Article in the Asahi Newspaper about the Opening of my Swan Art Gallery. 2009 November: Article in the Asahi Newspaper after the Ginsuzu Exhibition in. 2009 November: Article in the Town News of Kamakura about my exhibition at the Ginsuzu Gallery. 2009: Catalogue of the International Contemporary Ceramics Exhibition in Jingdezhen with my “Peony” Kamakura Red Vase. 2009 July: Pamphlet booklet from the groups exhibition at Koyasan organized by Happymaker. I had the show in the Ekoin Temple. 2009 July: Poster of 100 Contemporary Teapots of the West with my “Kamakura-Red "Bamboo" Teapot. 2008 May: In the Nagomi Japanese Magazine about the Tea ceremony. Aoyama-san from the Yufuku Gallery purchased my Horsehair Vessel as a “Mizusashi” for the tea ceremony! 2010 May: I wrote an autobiographic booklet about my ceramic experiences since I arrived in Japan in 2006 till 2008: “Ceramic adventures in Japan”. 2008 August: Catalogue of the 8th Mino International Ceramics Competition. I won an Honorable Mention Award. 2008 October: Catalogue of the 7th Mashiko International Ceramics Competition. I won a Commendation Award for the Horsehair Raku "Arsia Caldera" Plate. 2007 September: Exhibition at the Toko Gallery in Mashiko, Japan. 2007 May: Pamphlet of the exposition of the Nippon Togei Club in the Mitsukoshi Store in Tokyo. This was my 2nd participation. 2006 October: Catalogue of the 6th Mashiko International Ceramics Competition. I won the Special Judges’ Award for my Horsehair Raku "Four Season" Vase. "Landelijk Atelier weekend" and Opening of SwanCeramics Art Gallery.